What does the Tax Cuts and Jobs Act have to do with divorces and alimony payments? It turns out—a lot. In fact, the new law eliminates tax deductions for alimony payments related to post 2018 divorce agreements. Alimony for divorces pre-2019 that met the tax-law definition of alimony will continue to be deductible. According to a survey of the American Academy of Matrimonial Lawyers, 95 percent of members anticipate changes in divorce settlements due to the new tax plan. Therefore, all of the parties involved in a divorce (e.g., spouses, attorneys) should have a solid understanding of its effect on alimony awards. Paying Party: Alimony payments made by the payer are tax-deductible. Receiving Party: Alimony payments received by the recipient are included in taxable income. Note that the TCJA only affects alimony payments in connection with divorce agreements executed on or after January 1, 2019. Therefore, for taxpayers with alimony requirements in place before 2019, alimony payers will continue to be able to claim a tax deduction and alimony recipients will report the payments received as taxable income. Paying Party: Alimony payments made by the payer are not tax-deductible. Receiving Party: Alimony payments received by the recipient are not included in taxable income. For divorces finalized on or after January 1, 2019, the tax treatment for alimony is similar to child support. The paying party will not be allowed to deduct their payments for tax purposes, and the recipient will not need to pay tax on the payments received. This new treatment is likely to result in fewer after-tax dollars being available to both parties due to the alimony amount being subject to the higher tax rates of the paying party. As displayed in the example below, if Spouse #1 makes $400,000 and Spouse #2 makes $35,000, a much higher tax rate will be applied to the alimony payments under the new tax law. Therefore, the $100,000 of alimony payments paid to Spouse #2 will be taxed at Spouse #1’s higher tax rate. In the first scenario (deductible alimony payments, which are applicable for divorces finalized prior to January 1, 2019), Spouse #1’s taxable income includes a deduction for the alimony payments, which leads to a total cash flow of $205,810. 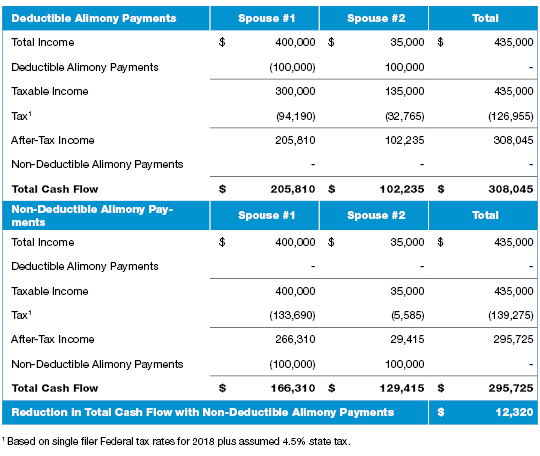 When compared to the non-deductible alimony payments scenario (assuming there is no change in the required amount of alimony), there is a reduction in Spouse #1’s total cash flow of approximately $39,500. As for Spouse #2, under the new tax rulings the alimony payments received will not be included in taxable income. When you compare the two scenarios for Spouse #2, this results in an increased cash flow of $27,180 if the alimony received is not taxable (again assuming that there is no change in the required amount of alimony between the two scenarios). As you can see in the example above, there is an overall reduction in total cash flow of $12,320 if the alimony payments are not deductible by the payer and not taxable to the recipient. This means there will be fewer after-tax dollars for the former spouses to divvy up under the TCJA ruling. Additionally, because the recipient will not have to pay tax on the alimony received, less alimony will be necessary to produce the same after-tax cash flow for the recipient. As a result, this may lead to lower alimony payments compared to divorces finalized prior to 2019. Do you have questions about alimony or other valuation-related matters? Please contact Ryan Hart in our Tax Department at (602) 730-3673.